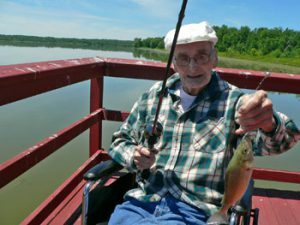 FULTON – Everyone has heard a story about, ‘the fish that got away’, but for one resident from Michaud Residential Health Services in Fulton who joined his fellow anglers during a trip to Bullhead Point, he has the story and the pictures to show off his catch. Michaud resident John Thompson shows off one of his “catches” made during a recent fishing trip. The cloudless skies made for an ideal afternoon out-of-doors, and a perfect day for fishing. Fortunately for the fish, Michaud residents practiced “catch and release” – fish were returned the lake after being caught, but probably with sore mouths. The fishing trip was just one of many outings residents at Michaud will be enjoying this summer. Residents will be boarding their bus for trips shopping, to the zoo, for picnics, and to many other local attractions, which are all on the activity calendar for the coming months. Located in the city of Fulton, Michaud Residential Health Services is a not-for-profit, non-denominational organization providing residential skilled nursing and physical/occupational rehabilitation services. Specialized services include Infusion Therapy and Wound Care Therapy. Michaud is a part of the St. Luke Family of Caring, an affiliation of community-based, not-for-profit healthcare providers serving the greater Oswego County area. Affiliates include Michaud in Fulton along, with St. Luke Health Services, Bishop’s Commons Enriched Housing Residence and St. Francis Commons Assisted Living Residence in Oswego.